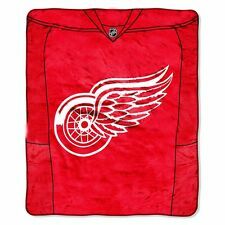 This Red Wings blanket is perfect for the NHL fan. This is a blanket with terrific design plus the words established 1926. Blanket Size: 57" X 77" Good on a twin size bed. Bedding Materials: Soft & Comfy Plush polyester. 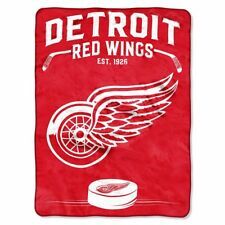 This Red Wings blanket is SOOO perfect for the NHL fan. Wonderful team colors & design with the team logos & colors. Blanket Features: bound edges&great design with the look of a Red Wings jersey. The background shows off a bold color matching your favorite NHL team with a large faded logo and an extra added side print, and the shams are in a contrasting color. You will never want to get out of bed! The perfect quilt for any Detroit superfan! The red border is made from a t-shirt and the flannel border is made from red, white and black pajama pants. The back is even made from a thick recycled dark red flannel sheet. 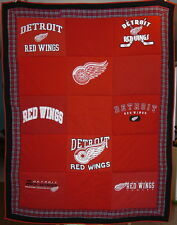 The perfect quilt for any Detroit Red Wings superfan! The black border is made from a t-shirt and the flannel border is made from red, white and black pajama pants. The back is made from a single piece of black anti-pill fleece from Jo-ann fabrics. The background shows off a bold color matching your favorite NHL team with a large faded logo, and the sham is in a contrasting color. You will never want to get out of bed! 100% Polyester comforter shell and sham, exclusive of decoration. The sheets match, with a repeating print of team logos on a white background. Sleep well in this soft and cozy bedding set. 100% Polyester. Machine washable. 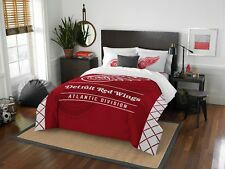 NHL Detroit Red Wings Full Bed In Bag Set. The sheets match, with a repeating print of team logos on a white background. Sleep well in this soft and cozy bedding set. 100% Polyester. Machine washable. NHL Detroit Red Wings Twin Bed In Bag Set. The sheets match, with a repeating print of team logos on a white background. Sleep well in this soft and cozy bedding set. 100% Polyester. Machine washable. 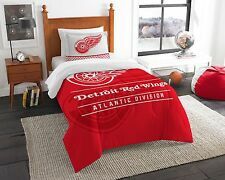 NHL Detroit Red Wings Queen Bed In Bag Set.